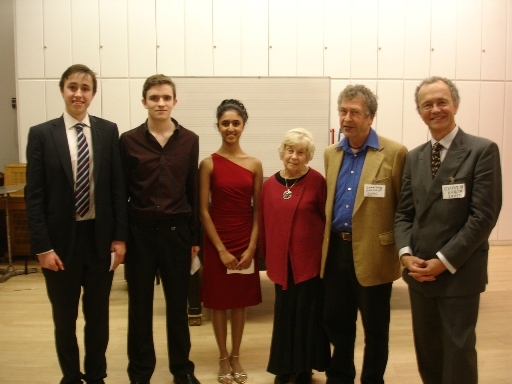 The Final of the Association of English Singers and Speakers Catherine Lambert Junior Recital Prize was held in the Durrington Room of the Royal College of Music on Saturday November 10th. The panel of judges was Betty Roe, Jonathan Courage and Stephen Varcoe. The winner of the £300 first prize was Julius Haswell, a student of Veronica Veysey Campbell. His memorised, ‘themed’ programme of English song, poetry and prose was entitled ‘Love lost through war’. The runner-up, winning £200, was Natasha Agarwal, who studies with Caroline Crawshaw. Her programme was entitled ‘This England’. Third place (£100), plus the ‘Speech’ prize (£200), was awarded to Rhys Jupiter Brown, another student of Veronica Veysey Campbell. The Association is most grateful to our sponsors, Catherine Lambert, Coral Gould and Marian Lines, to our panel of judges, our administrator Carolyn Richards and Peter Hewitt and John Mitchell of the Junior RCM. Julius Haswell, Rhys Jupiter Brown, Natasha Agarwal, Betty Roe, Jonathan Courage and Stephen Varcoe. This entry was posted in Past Events on November 10, 2012 by AESS.